Another for the collection of unusual interstellar molecules, this is H3+. 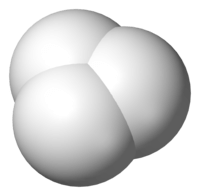 You won’t find it anywhere on Earth (Earth is rather a lot hotter and denser than H3+ likes), but it’s one of the most common molecules in the universe. Its two electrons are shared across the three nuclei, which is quite uncommon in itself. 3-c-2-e bonding only really happens in the lightest elements. Off the top of my head, the only other one I know about that does this is Boron. So why is H3+ so good? Actually, it’s the main reactant in so much interstellar chemistry it’s untrue! H3+ is actually what’s responsible for creating a lot of the compounds out there that contain hydrogen – including water. Actually, other than interstellar space, the only place you’ll really find this molecule is in the atmospheres of giant planets like Jupiter. Interestingly, it’s effectively created by cosmic rays. Any cosmic rays shooting through interstellar clouds have so much energy that they leave a trail of H2+ in their wake. This makes hydrogen unhappy, so it steals extra protons from it’s neighbours, forming H3+. This entry was posted in chemistry, Imported from Livejournal and tagged astrochemistry, molecules. Bookmark the permalink.